Sleek, white and oh so sterile, most iPod docks are a little joyless, but it doesn't have to be that way, as this retro-futuristic mash up shows. Retro-Futurist, Atompunk or even Ray Gun Gothic; it doesn't matter what you call it, this iPod dock is probably coolest you're likely to see in a long time. Built into an old piece of audio test equipment, the dock can also be used as a regular speaker, or have a guitar plugged into it. 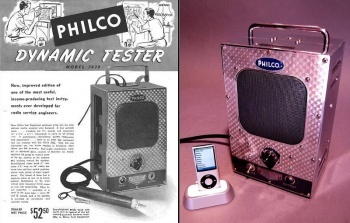 Creator Pete Verrando is a sound production recorder who has been restoring and building audio devices "since his teen years" created the dock out of a 63 year old Philco Dynamic Tester which was apparently "just a small amplifier/speaker combination with an external probe for fixing audio equipment." The dock has gone up on ebay, and wouldn't look out of place in your Megaton home.